No way we’re already on the last stop at this amazing Road-Trip! Can’t believe we started in LA, made a big turn trough Las-Vegas and al the National Parks and still made it -all the way- up to Seattle!! I think it’s fair to say we did quite some travelling in these three weeks! Seattle was an amazing last stop though!! We could only spend half a day there, but managed to see many of its amazing hot-spots and features. 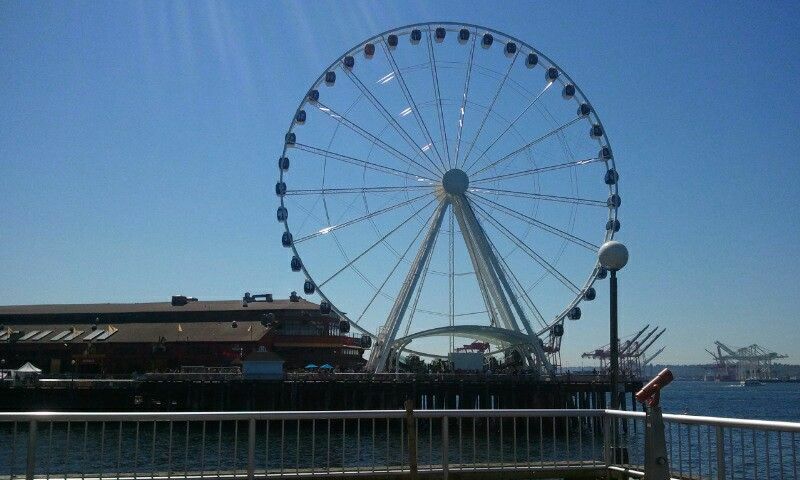 When I think of Seattle, for me three things came to mind: the Ferris Wheel, The Oldest (not nr 1 but I’ll explain that later) Starbucks, and the famous Fish-tossing… which apparently it’s not the first thing to pop into other people’s minds. Anyways, we knew we didn’t have all the time in the world so these were things I really wanted to see! I guess this one doesn’t need so much explaining. Don’t all people like to see a Ferris Wheel? Especially one that’s on the dock? Maybe because it’s a combination of an amusement park and an amazing view of the city? Who knows? I liked it! So apparently I made a -more common- mistake thinking that Seattle is the location of the First Starbucks. But this ain’t the real story. Apparently the First Starbucks doesn’t exist anymore, which makes this the oldest Starbucks. But hey, still enough reason to pay this Starbucks a visit. Apparently its a real hot-spot, and it can be quite a challenge to get a coffee here because so many tourists have the same idea. We decided to get here first thing in the morning and that was a great choice! We got a table and enjoyed our great Starbucks-coffee with a small breakfast on the side! The Pike’s Place Market is really something you can’t skip! It’s lively, cosy and yes: you can see the fish being tossed here! I really loved it!! And -of course- I’ve got it for you on video! I never knew that flying fish would make people thit happy 🙂 Including me! Of course there are still way more things to do in Seattle. 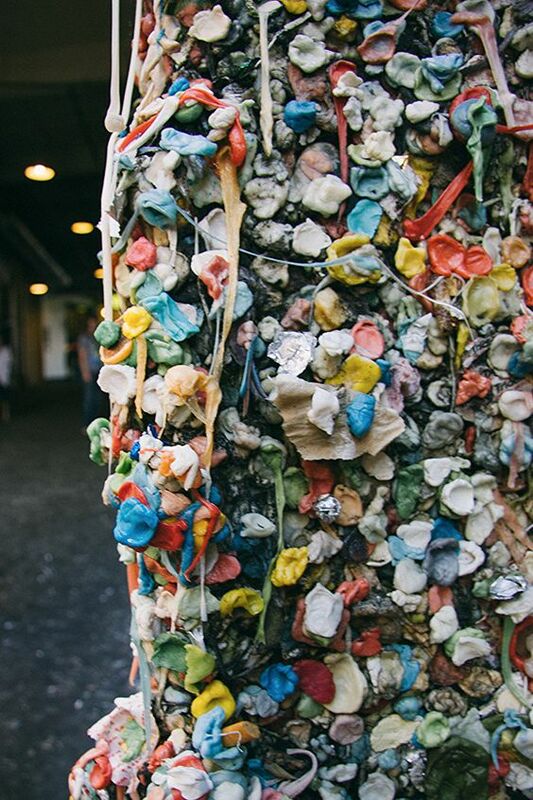 We’ve also payed a visit to the famous gum-wall. Yes… it is how it sounds. 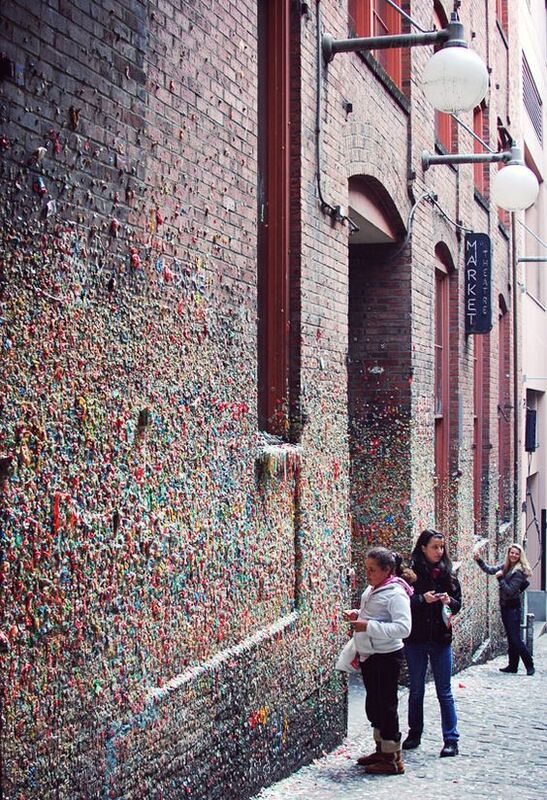 There’s an alley, with walls completely covered in gum. It’s some of the weirdest forms of art that I’ve seen I guess. And walking trough it made me a bit sick to the stomach I must say. Maybe the trick is not to think about it too much, cause as a tourist you really cannot skip this one. Of course there are way more amazing things to see in Seattle, like the Space Needle. So I can definitely advice you to go there for a bit longer than we did! Cause the city is amazing!